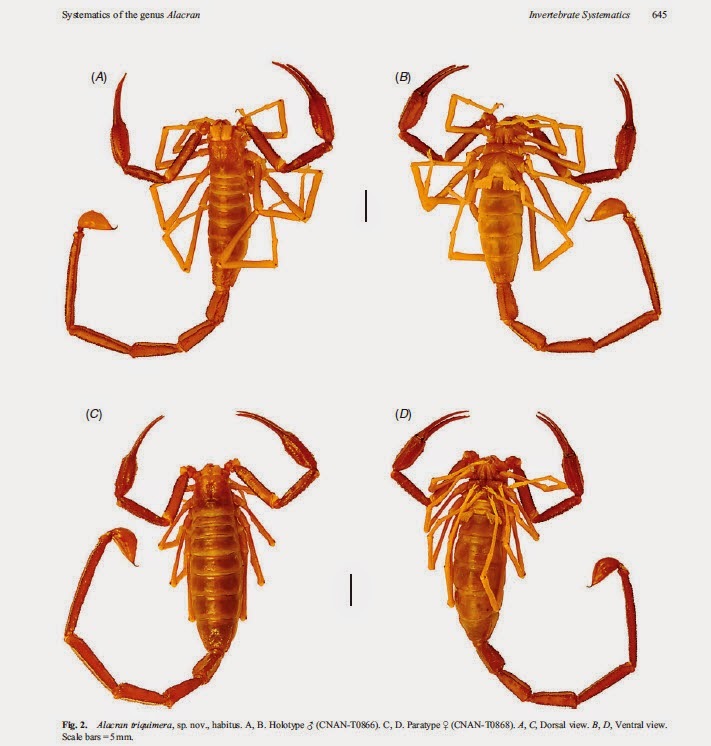 There are many fantastic scorpions in the world, but among the more special are those being true troglobites showing special adaptions to a life in deep caves.The endemic genus of Mexico, Alacran Francke, 1982 (Typhlochactidae) is one of these special scorpions, only being found in deep caves. state of Puebla, south-eastern Mexico. The three member of Alacran inhabit three isolated caves or cave systems. The article discuss how this distribution has originated. A identification key for the genus is included. The scorpion genus Alacran Francke, 1982, endemic to eastern Mexico, was created to accommodate Alacran tartarus Francke, 1982. This remarkable troglobiotic species is adapted for life in some of the world’s deepest caves, 720–916 m below the surface in the Sistema Huautla of the state of Oaxaca (the deepest records at which a scorpion has been found). A second species, Alacran chamuco Francke, 2009, was later described from Te Cimutaá, also in Oaxaca. In the present contribution,we describe a third species, Alacran triquimera, sp. nov., recently discovered in a cave system in the state of Puebla, and test the monophyly and internal relationships of Alacran, based on a cladistic analysis of 10 terminal taxa (including seven species representing all four genera of Typhlochactidae) and 151 informative morphological characters, building on a previously published matrix. The single most parsimonious tree obtained, supports the monophyly of Alacran and the following relationships among its component species: (A. chamuco (A. tartarus + A. triquimera, sp. nov.)). The phylogenetic relationships among the three species of Alacran are consistent with the biogeographical history of the caves they inhabit. Based on the geological history of the Sierra Madre del Sur and the likely similar speleogenesis of the Tres Quimeras, Sistema Huautla and Te Cimutaá caves, we propose a vicariance hypothesis to account for the disjunct distribution of the three species of Alacran, whereby an initially more widespread, panmictic ancestral population speciated into thre geographically isolated taxa following fragmentation of the southern Sierra Madre del Sur. Thanks to Carlos Santibantez-Lopez for sending me this article!